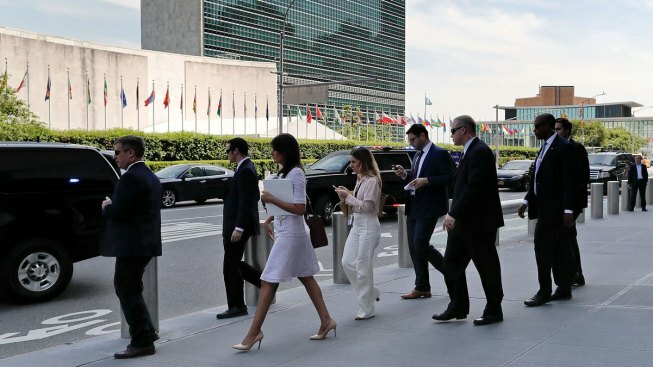 United States ambassador to the United Nations Nikki Haley, third from left, walks from the U.S. Mission to the U.N. in New York across the street to the U.N. building, Tuesday, May 29, 2018. The U.N. Mideast envoy told an emergency Security Council meeting Wednesday that the latest escalation in Gaza between its Hamas rulers and Israel is a warning of "how close to the brink of war we are every day." Nikolay Mladenov said the international community should "unequivocally condemn" Hamas' massive attack against Israel using 216 rockets and mortars. Israel responded with 65 airstrikes on Hamas and Islamic Jihad targets in Gaza. Mladenov called it the most serious escalation since the 2014 Israeli-Hamas conflict. Hamas said earlier Wednesday it had agreed to a cease-fire, and Mladenov said that since 5 a.m. local time there have been no attacks by either side. "It is imperative that this period of calm be preserved at all costs," he said. "No one in Gaza can afford another war. No one has the right to play with the lives of two million people who have lived through hell in the last decade." Hamas forcibly wrested control of Gaza from the rival Fatah party in 2007 after winning legislative elections, triggering an Israeli-Egyptian blockade that has severely restricted the movement of most of Gaza's inhabitants. Mladenov said "the dangerous escalation" in Gaza can't be divorced from two months of mass protests at the border fence with Israel in which some 110 Palestinians were killed and large numbers injured by Israeli military fire. "As demonstrations and protests in Gaza continue into the month of June, I am concerned that we may experience further violence and further risks of escalation," he said. The Security Council meeting again demonstrated the paralysis of the U.N.'s most powerful body, and its inability to agree on any action. U.S. Ambassador Nikki Haley, who called the meeting, noted that Hamas claimed responsibility for this week's "outrageous terrorist attack" against Israel. Protests grow at the Israeli-Gaza border over the weekend as Palestinians protest the opening of a new U.S. embassy in Jerusalem. The U.S. broke tradition with other countries, which continue to keep their embassies in Tel Aviv. She said this "proves what we have consistently maintained — namely, that Hamas' stated purpose is the destruction of Israel." Haley said a statement proposed by the U.S. that would have the council condemn the Hamas attacks "should have been a no-brainer" — but it was blocked. Kuwait's U.N. Ambassador Mansour Al-Otaibi, the council's Arab representative, countered that "the Israeli occupation bears full responsibility for the latest escalation on our occupied land." "For as long as this occupation continues the Palestinians have a legitimate right to fight it and to defend their aspirations and their dreams to independence and dignified and free life," he said. "We support their fight and commend their steadfastness in front of the destructive Israeli machine." Al-Otaibi said three council press statements Kuwait proposed that called for an independent investigation of the deadly Gaza protests were also blocked — by the United States. Therefore, he said, Kuwait has circulated a draft Security Council resolution that would condemn Israel's use of force against Palestinian civilians and support deployment of an international force to protect civilians. Riyad Mansour, the Palestinian U.N. ambassador, said the Palestinians "totally reject" Israel "casting itself as the victim, when it is in fact the occupier, aggressor and oppressor and has appointed itself judge, jury and executioner of the Palestinian people." He said the latest cycle of violence was "fueled and incited by a series of Israeli aggressions and rhetoric," particularly since the mass protests began on March 30. Mansour urged the council to take action now "to de-escalate this dangerous situation" and "deter the descent into more violence and chaos" — and to provide international protection for the Palestinian people. But diplomats said the U.S. indicated in closed consultations that it will veto the Kuwaiti resolution. Israel's U.N. Ambassador Danny Danon called the Kuwaiti resolution "shameful," holding up pages from the draft and saying "it doesn't even mention Hamas." He also called for council action — "to condemn Hamas for its war crimes against Israelis and Palestinians" and "to pass a resolution designating Hamas as a terrorist organization," just as it did with the Islamic State extremist group and al-Qaida. This would enable the council to sanction Hamas' leaders, he said. But there is almost no chance of the divided council taking those actions.